France-bound Wales centre Jonathan Davies admits his final Scarlets game, against Cardiff Blues at Parc y Scarlets on Saturday, will be an emotional one. Davies, 26, has signed a two-year deal with Clermont Auvergne. "It will be a bit emotional with everything and it's quite strange knowing I'll not be coming back here next season," said Davies. "I've loved every second of my Scarlets career and I've got fond memories." 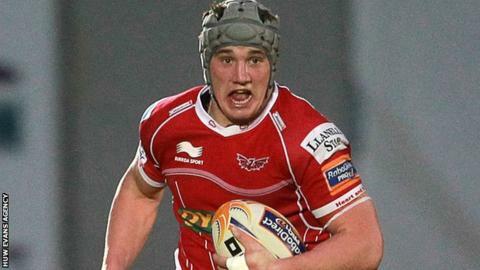 Davies says he is determined to leave the region with a win over their Welsh rivals. "It's going to be a tough game. The Blues have had some big results. We have to make sure we are on top of our game," he insisted. "There is going to be emotion, but you have to put that to one side and get down to business and do the job." British and Irish Lion Davies, capped 39 times by Wales, is not the only Scarlet playing their last game for the region, with Wales flanker Josh Turnbull figuring in his final match before joining the Blues. "I came through the academy with Josh and he is a very close friend," added Davies. "As long as we can finish off with a win and make sure the fans go away happy that's the most important thing. "I've had a great time over the years and grateful for all the support I've had. "I was quite green when I came in and it was full of senior players like Steve Jones, Iestyn Thomas and Matthew Rees. "It was great to be a part of the Scarlets growing up." But now Davies feels ready for a fresh challenge as he joins the likes of Mike Phillips, Jamie Roberts, Dan Lydiate, who all play for Racing Metro, in France. "There will be a language barrier, but I'm really looking forward to it," he said. "You speak to the boys and they enjoy it out there hugely. "It's a tough league to play in but I can't wait to put myself out of my comfort zone and challenge myself again."